Invitations are one of the most vital aspects of wedding planning. They set a stylized tone for the big day, share details about the event, and clearly define who is invited to join in the festivities. It's important to invest in invitations that accomplish all three goals and include the right look and feel to match your perfect day. We offer elegant and whimsical designs and provide quality service along the way. We curate every detail to match your style, tone, and personality. 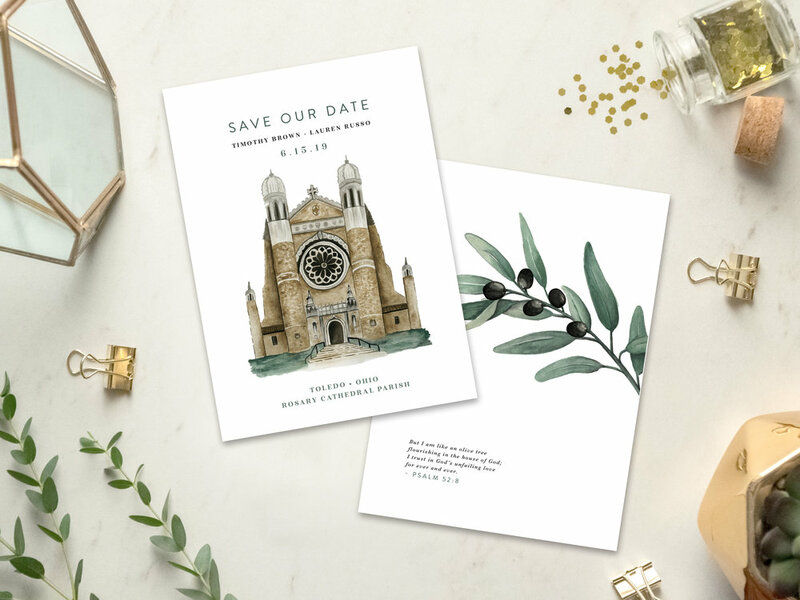 If you’re anything like us, the value of invitations won’t only be used for your wedding, but will be keepsakes to cherish for a lifetime – and sometimes your guests even keep the art, too! People often wonder the difference between pre-made invitations you can buy online versus custom invitations when working with a stationer. The biggest difference is personality! When buying a pre-made design online, it most likely doesn’t capture the spirit of you and your fiance, and all the little details captured in your unique love story. Want your “song” lyrics designed on the back of a card? We can do that for you! Interested in a pretty little venue illustration? You got it! When working with Pip & Cricket, we collaborate with you to find the right tone, color palette, paper stock, and art elements to truly tell your story that includes details that mean the world to you. The average custom Pip & Cricket wedding invitations include: a double sided invitation card, response card, details card, blank colored outer envelope, and response card envelope, but not every suite is the same! We’ll work with you to decide what’s included in your suite. Our pricing varies depending on quantity, number of cards printed, and additional pieces such as envelopes liners, additional cards, pockets, ribbons, wax seals, addressing, postage, and all of the other Pinterest-worthy embellishments we can dream up. Once we receive the information from the initial questionnaire, we will provide you with a detailed quote tailored to your wedding vision and budget. After you’ve filled out our custom invitation questionnaire, we’ll send you a personalized proposal tailored to your wishes and budget. Once your customized package is agreed upon, you’ll get a little “assignment” from us – the Couple’s Story & Invitation Details questionnaires. These are the forms that inspire your invitation suite! You’ll also gain access to a personalized client portal that stores our proofs, revisions, and questionnaires all in one place! Once we’ve learned about your love story, your favorite things, and your wedding details, we’ll provide you with a custom look book for your wedding! The look book includes: color palette, design aesthetic, inspiration images, and detailed descriptions. This step will also include a preliminary sketch or mockup design of your invitation artwork. We’ll begin working through the details to make sure you absolutely love the direction the design is going before any major artwork is produced. After we agree upon the direction of the pieces, and you approve the initial sketch/mockup, the fun part begins! We will begin to create your custom stationery! You’ll then receive the proofs for printing approval. We’ll work together to make any adjustments and then we’ll take care of the rest of the details. All of your pretty paper goodies are sent to the printer. Hooray! Then, if you opted for us to assemble, we will start working on that for you! Anything from envelope printing, custom stamps, to wax seals — we take care of the gluing, stamping, stuffing and sticking so you can just sit back and relax and enjoy a date night with your fiance, without adding any extra to-dos on your list. Your stunning hand-crafted invitations will arrive in your guests’ mailboxes! (Eeek!) The next major thing you have to do is get all dressed up and marry the love of your life! We will even match the details from your invitations to your day-of signage! We offer anything from a matching snapchat filters and signature drink signs!